More of "The BATMAN, 1935"
Here's the first page of Detective Comics #875, out in every comic shop tomorrow. Today's offering: A look at a detail from a double spread in #875 and, below, the (half inked) layout of the spread. A week from today, on Wed March 30th, Detective Comics #875 will be in stores. It's, without doubts, the best issue I have done with Scott on Detective so far, and def one of the best book I have done in quite some time. Today's offering: the last splash page from Detective 874 teasing at the upcoming story in #875. I just wanted to tell you to mark your calendars, 'cause April will see the return (and completion over several weeks) of "Kara Bocek", one of the first adventure of our beloved masked hero, The Black Beetle. 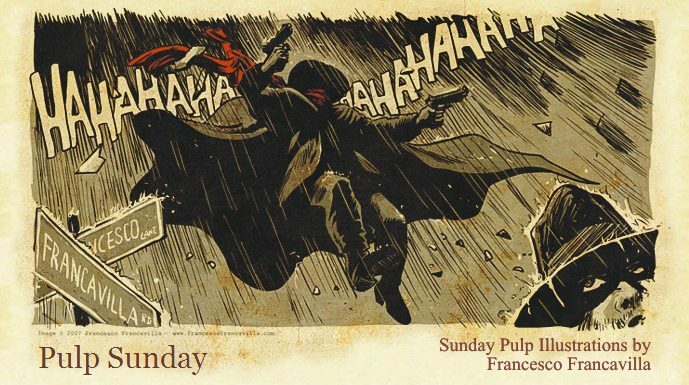 And I hope everyone is having a wonderful Pulp Sunday. I just wanted to share a little more of THE BATMAN 1935 concept story. Since everyone seemed to enjoy the concept art for BATMAN 1935 (a pulp noir tale, not a steampunk thing, as I read on some websites ;)), here's another concept art from another story I have in my bat-case file cabinet: "CRIMSON HARVEST". I did this little tribute yesterday to celebrate Will Eisner's birthday (even Google had a tribute on their homepage! ).